Billings c. 1882. All historic images courtesy of Western Heritage Center. At the time of my field work for the Montana state historic preservation plan in 1984, I had already gotten myself deep into one Montana place–Billings, the seat of Yellowstone County, and its early history. I have to blame June Sampson, David Carroll, and Lynda Moss at the city’s Western Heritage Center for my initial immersion–they along with board members wanted a research report about both the town of Coulson, the short-lived precursor to Billings along the Yellowstone River, and the early history of Billings, the railroad town. Billings birdseye view, detail, 1904. Starting in 1982, I began to drive to Billings, explore the landscape, dig into archives and museums, and talk to people, which of course meant in 1982, when the city was a mere 100 years old, there were a few children of the founders still around for interviews. At first the competition between Coulson and Billings captivated me, particularly the efforts of regional merchant Perry W. McAdow to transfer his business dominance from Coulson to the new city of Billings by placing his store on Minnesota Avenue, on the south side of the Northern Pacific Railroad, rather than on Montana Avenue, on the north side of the tracks, where development was controlled by one of the west’s leading capitalists, Frederick Billings. Perhaps it is symbolic, or even appropriate, that McAdow’s first store on Minnesota Avenue still stands–but its best days long ago passed away, leaving it today as a junk store in 2011, or in 2015 the Big Sky Blue Gallery. While, on the other hand, a grand statue of Frederick Billings–who never lived here but did come to visit his son Parmly–stands on the north side of the tracks, and helps to mark Montana Avenue as the predominant commercial street in Billings. Northern Pacific Railroad. And when U.S. Highway 10 was designated through the city in the 1920s–first known as the Yellowstone Trail–it used Montana Avenue to pass through Billings. The bright, shiny, and busy appearance of Montana Avenue in this second decade of the 21st century, however, is a fairly recent phenomenon. When I did the bulk of my research in Billings from 1982 to 1992, there was not much going on, outside of the Rex Hotel. The depot was boarded up, and falling apart. Listing Montana Avenue as a historic district in the National Register of Historic Places in the 1990s began to change the street’s fortunes, along with the development in that same decade of the Western Heritage Center as a real cultural anchor and heritage tourism lure, and then the investments by new entrepreneurs who convinced city officials to revisit sidewalks, add plantings, and make the street more pedestrian friendly. It has been a bit amazing to see this transformation in the past decade as Montana Avenue became an “it” place–and shed its forgotten, tired past as a railroad corridor. 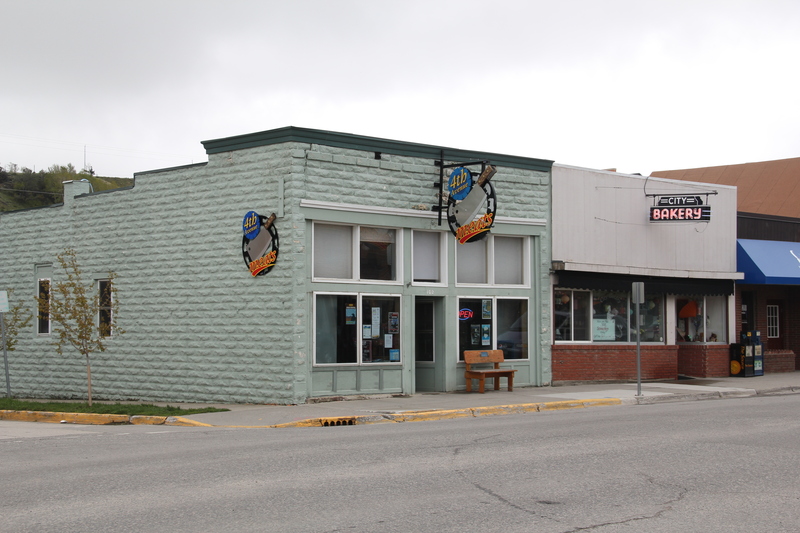 Kalispell’s Main Street–the stem of the T-plan that dates to the town’s very beginning as a stop on the Great Northern Railway–has a different mix of businesses today than 30 years ago when I visited during my state historic preservation plan survey. It also now is a historic district within National Register of Historic Places, noted for its mix of one-story and two-story Western Commercial style businesses along with large historic hotels and an opera house for entertainment. The Opera House, and I’m sorry you have to love the horse and buggy sign added to the front some years ago, dates to 1896 as the dream of merchant John MacIntosh to give the fledging community everything it needed. On the first floor was his store, which over the years sold all sorts of items, from thimbles to Studebakers. The second floor was a community space, for meetings, a gymnasium, and even from a brief period from 1905 to 1906 a skating rink. In this way, MacIntosh followed the ten-year-old model of a much larger building in a much larger city, the famous Auditorium Building in Chicago, providing Kalispell with a major indoor recreation space and landmark. Allegedly over 1000 people attended a performance of Uncle Tom’s Cabin soon after the opening. Another highlight of the historic is the Kalispell Grand Hotel (1912), designed by local architect Marion Riffo and constructed by B. B. Gilliland, a local builder. Designed not only as a railroad hotel for traveling “drummers,” it also served as a first stop for homesteaders flooding into the region in that decade. Montana writer Frank B. Linderman was the hotel manager from 1924 to 1926, and his friend western artist Charles M Russell visited and stayed at the hotel in those years. This place, frankly, was a dump when I surveyed Kalispell in 1984-1985 but five years later a restoration gave the place back its dignity and restored its downtown landmark status. The Alpine Lighting Center dates to 1929 when local architect Fred Brinkman designed the store for Montgomery Ward, the famous Chicago-based catalog merchant. Its eye-catching facade distinguished it from many of the other more unadorned two-part commercial blocks on Main Street. My favorite Main Street building is probably the cast-iron, tin facade over a two-story brick building that now houses an antique store. It was once the Brewery Saloon (c. 1892). This is a classic “Western Commercial” look and can be found in several Montana towns. Main Street defines the heart of the business district. Along side streets are other, more modern landmarks. Let me emphasize just a few favorites, starting with the outstanding contemporary design of the Sutherland Cleaners building, located on 2nd Street, the epitome of mid-20th century Montana modernism. It is such an expressive building but of course in 1984 it was “too recent” for me to even note its existence. At least I had enough good sense to note the existence of its neighbor, the Art Deco-styled Strand Theater (1927). I enjoyed a movie there in 1984–and the theater kept showing movies until 2007. The preservation of the Strand Theater, and the other downtown historic theater building, the Classical Revival-styled Liberty Theater (1920-21) by Kalispell architect Marion Riffo, is the work of the Fresh Life Church, which owns and uses both buildings to serve its congregation and the community. Another modernist favorite is a Fred Brinkmann-inspired design, the flamboyant Art Deco of the historic City Garage (1931), now home to local television station. On the other side of Main Street is another building that evokes 1930s interpretation of Art Deco, the Eagles Lodge Building, a reminder of the key role played in fraternal lodges in developing towns and cities in early Montana. 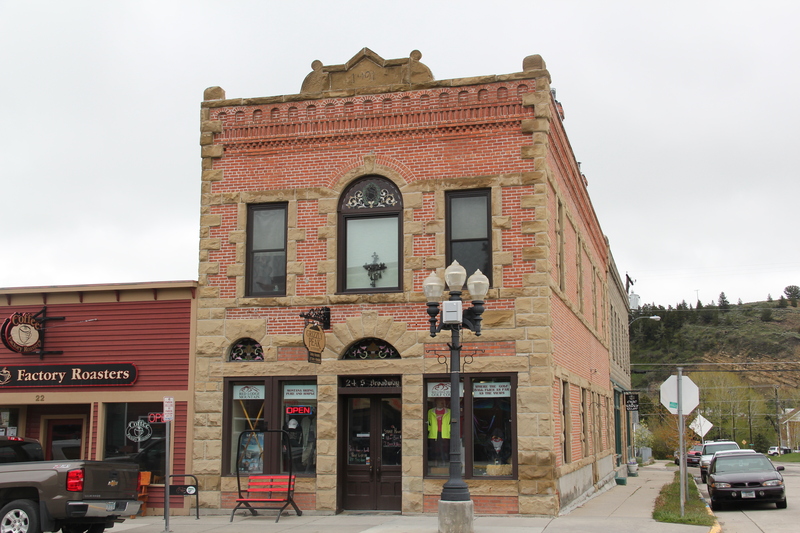 Let’s close this look at Kalispell’s commercial architecture with the Kalispell Mercantile Building (1892-1910), which was established by the regional retail powerhouse, the Missoula Mercantile, at the very beginning of the city’s existence. Kalispell has figured out what Missoula refuses to do–that a building such as this is worthy of preservation, and if maintained properly, can continue to serve the town’s economy for decades more. occurred, creating one and two-story brick buildings with dazzling Eastlake-styled cast-iron facades. The town was incorporated in 1890. The quality of the Victorian commercial architecture still extant in Phillipsburg, such as the 1888 Sayrs Block above, astounded me during the 1984-85 preservation work. So much was intact but so much needed help. 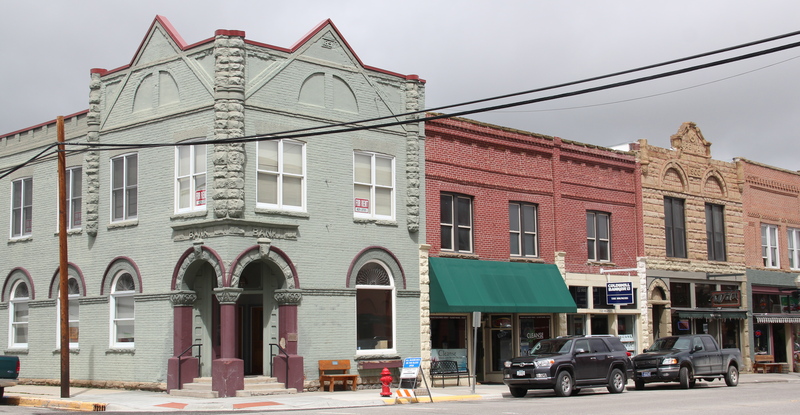 Residents, local officials, and the state preservation office understood that and by 1986 the Philipsburg Commercial historic district had been added to the National Register of Historic Places. What is exciting is that in this decade, entrepreneurs are building upon early successful renovations and adaptive reuse project to launch new businesses and create new jobs. The town’s population is growing, after 30 years of decline. No business has been more central to this transformation than the Sweet Palace, shown above, which is next door to the two-story brick Masonic Lodge. Another key to recent success has the resurrection of local hotels and bed and breakfast establishments, along with the staging of various summer productions at the town’s Opera House Theatre, built in 1896, making it the longest continuous operating theater in the state. These properties give visitors a reason to stay longer, and not just stop at the Candy Store, grab a brew at one of the town’s historic bars, and then move along. The town has recently added an amphitheater, located behind the historic school building, that also serves summer events that drive ever-increasing numbers of people to visit this mountain mining town and to spend more time and money there. This is modern-day heritage development at work. was the Philipsburg School, with its soaring tower symbolizing the hopes that residents had for Philipsburg’s future in the 1890s. The historic school, which is listed in the National Register, remains although the community built a new building adjacent to the historic one in 1987. (you can see a corner of the new building at the lower left). When I first visited in 1984 the only building in Philipsburg listed in the National Register was the Queen Anne-styled Granite County Jail of 1902. It also remains in use. But now the Classical Revival-styled Granite County Courthouse (1913) is also listed in the National Register. Designed by the important Montana architectural firm of Link and Haire, this small town county courthouse also speaks to the county’s early 20th century ambitions, with its stately classical columned portico and its central classical cupola. By climbing the hill above the courthouse you also gain a great overview look of the town, reminding you that these rather imposing public buildings are within what is truly a modest urban setting that is connected to the wider world by Montana Highway 1. A couple of final thoughts on Philipsburg. Its range of domestic architecture from c. 1875 to 1925 is limited in numbers but impressive in the variety of forms, from brick cottages to brick Queen Anne homes to textbook examples of bungalows and American Four Squares. Listed in the National Register of Historic Places, the M.E. Dow House is a frame Queen Anne home, modest considering the flamboyant Eastlake-styled cast-iron front to his downtown business block. The Philipsburg Cemetery, which like so many that I ignored in 1984-1985, was a revelation, reflecting the quality of Victorian period architecture found in the town. The beauty and serenity of its setting were impressive enough, but then some of the family plots and individual markers reflected Victorian era mortuary art at its best. This cast-iron gate, completed with urns on each post and the music lyre gate, is among the most impressive I have encountered in any small town across America. And this cemetery has two separate ones. Many grave markers came from local or nearby masons but others, like these for the Schuh and Jennings families, were cast in metal, imitating stone, and shipped by railroad to Philipsburg. Other markers are not architecturally impressive but they tell stories, such as the one below, for Mr. George M. Blum, a native of Germany, who was “killed in runaway at Phillipsburg” in 1903. I look forward to a future visit to this cemetery for further research. Since my earlier work on the state historic preservation plan in 1984-1985, few places in Montana had experienced such rapid population growth as Stevensville. The place had just over 1200 residents in the 1980s, and that increased to a mere 1221 in 1990. But now Stevensville is close to 2,000 in population. But enough is still here–like the historic mill complex above–that even as the business changes there is still the feel of an agricultural town at Stevensville. 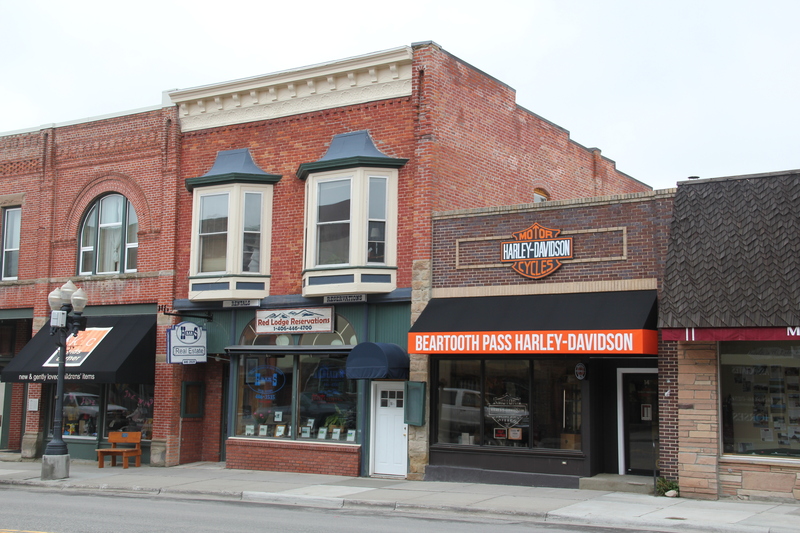 A major reason for the sense of continuity is the Stevensville Commercial Historic District, which has helped to protect the core of the town. Classical Revival-styled bank building, where the blocks are shaped to resemble masonry. You can find this architectural treatment across the state, most often in residential architecture. The Stevensville bank is an important commercial example. which is now the United Methodist Church, while the two-story brick American Four-Square house below is the historic Thornton Hospital (1910), but now serves as the Stevensville Hotel. Both buildings are listed in the National Register. One area that I really failed to consider in the 1984-1985 work was the diversity and cohesiveness of the historic residential neighborhood. It too has been documented by a National Register historic district, but some dwellings, such as the impressive Classical Revival-styled Bass House have been individually listed. Another favorite dates to the 1930s and the impact of the International Style on Montana domestic architecture: the Gavin House, with its flat roof, its boxy two-story shape and bands of windows at the corners. Between these two extremes of early 20th century domestic design, Stevensville has an array of architectural styles, from the Folk Victorian to the more austere late 19th century vernacular to bungalows to revival styles. Stevensville residents have used the National Register as an effective tool to commemorate their pasts but also to lay the foundation for a 21st century future in the midst of the some of the most rapid growth in the state. The quality of Bozeman’s historic residential area between downtown and Montana State University was apparent even to me in 1984-85–someone at the time much more in tune with public buildings, industrial corridors, and downtown blocks than the mix of Victorian, vernacular, and 20th century revival styles that you find in Bozeman’s historic neighborhoods. Everyone at the state historic preservation office was excited about the 1985 listing of the Burr Fisher House, designed in distinctive Spanish Colonial style by Bozeman architect Fred Willson, and wherever you looked you saw potential for many other properties, if not entire neighborhoods. Passing decades had left to neglect, perhaps not the wisest choices in treatments or tenants, but the potential remained to be tapped. As indicated by the above before and after photos, with the 1985 image on the left and the 2015 image on the right, the last 30 years have been a time of transformation and restoration in many of the downtown neighborhoods. Indeed, where there were no historic residential historic districts, there are now multiple districts, crisscrossing the city and creating a real foundation for community stability, pride, identity, and growth. and its long horizontal massing and stylish entrance, to the contemporary styles of the 1960s into the 1970s, as seen below, in the Grand Avenue Catholic Center, and the contemporary style house on Story Avenue. These dwellings are truly just a taste of the richness and diversity of architectural statements in the town’s historic neighborhoods from Main Street to the university. Bozeman’s successful neighborhood districts represent one of the lasting achievements of historic preservation and property owner engagement in Montana over the last 30 years. Many heritage areas in the eastern United States emphasize the relationship between rivers, railroads, and industrial development and how those resources contributed to national economic growth and wartime mobilization. Great Falls can do that too. Situated on the Missouri River and designed by its founders to be a northwest industrial center, entrepreneurs counted on the falls to be a source of power and then on the railroads coming from Minnesota, especially the promising Manitoba Road headed by James J. Hill, to provide the transportation. preservation plan in 1984 the smelter stack had recently come down but a good bit of the surrounding industrial plant remained. When you look at the same place today, the site has been nearly wiped clean, still closed off to the public but ripe for the day when it could be a center for public interpretation of the impact of the smelter on the city, state, and nation. have taken on new uses as offices and museums, such as the local history center and the well-regarded children’s museum. “metropolitan corridor” written about by historian John Stilgoe; Great Falls is superb extant example of how the corridor shaped the landscape and architecture presence of urban centers across the northern plains. These properties suggest the richness of the industrial and transportation stories associated with the rise of Great Falls and its role in western history. Red Lodge’s commercial district is listed in the National Register of Historic Places. 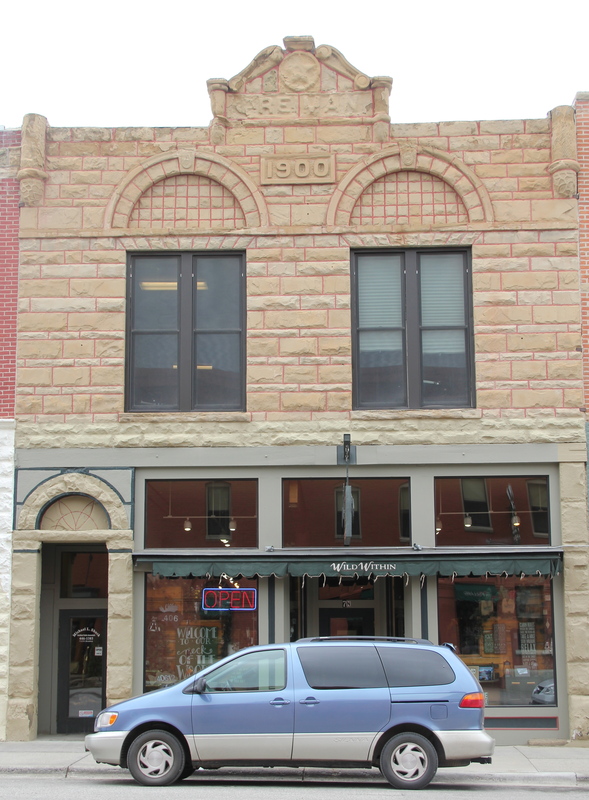 While the construction dates in the district span over 100 years, from the 1890s to more recent modern-era “in fill” buildings, the most notable pattern is the number of two-story stone or brick commercial buildings from the turn of the 20th century. The landmark Pollard Hotel is a good example. Opened in 1893 as the Spofford Hotel, the building was an instant business landmark, a hotel located halfway between the depot and the heart of the new city. As the boom intensified at the turn of the century, Thomas Pollard bought the place and doubled its size in 1902. The Pollard served as that “booster” hotel, designed to show businessmen and investors that Red Lodge was an up and coming place. The Pollard was not alone in defining the city’s look. Facing it were long blocks of two-part mostly brick commercial buildings, with retail and sales on the first floor and residences and offices for a growing professional class on the 2nd floors. The decorative cornices proudly proclaimed that the new buildings were part of the new century, and a promising era for all involved. Of course commercial design in more settled areas to the east and west had already moved away from the heavy masonry typical of the 1880s–but Red Lodge was largely a Victorian commercial district for what would be a 20th century mining boom town. 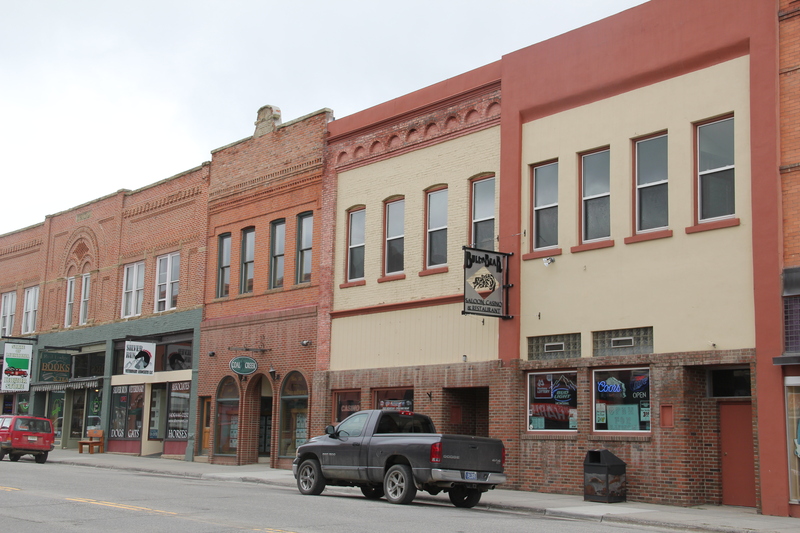 While two-story, two-part commercial blocks set one pattern in historic Red Lodge, another is created through the rhythm of the large commercial enterprises and the less ambitious one-story brick buildings of the district. 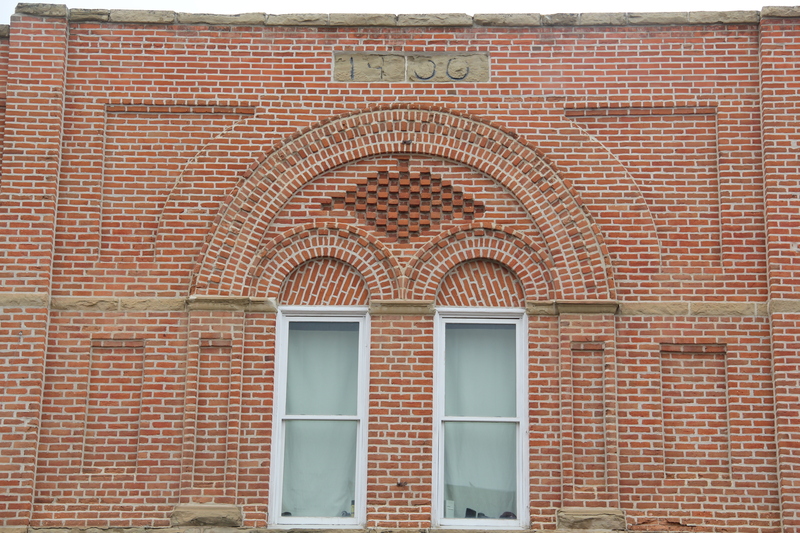 Here is another building material found in abundance, rusticated concrete block meant to mimic stone masonry, and the stuccoed top half of the bakery building is another reminder that some owners used imitation materials to fit into Red Lodge’s streetscapes. While the commercial district retains much of what made it a special place when I first visited over 30 years ago, it has lost some of that small town Montana feel as owners increasingly cater to those tourists passing through. 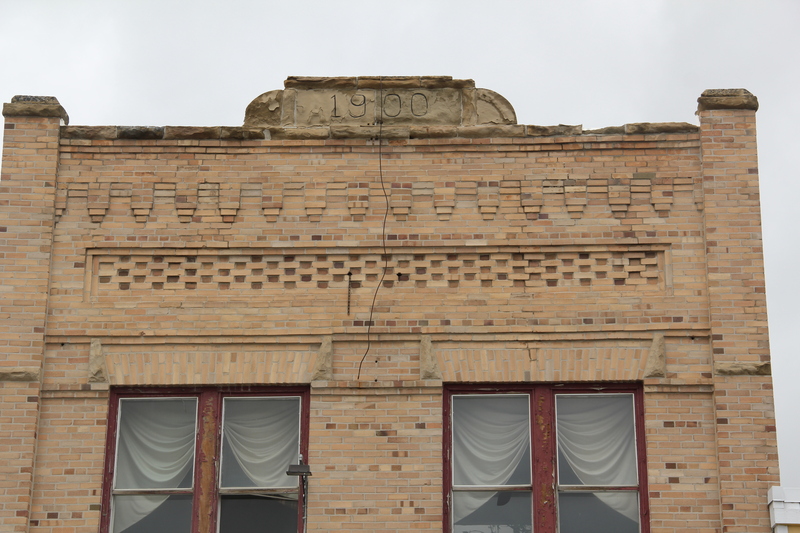 The challenges of preservation in Red Lodge will be the next topic.